Today I’m posting my interview with Beth Krommes, whose beautiful scratchboard illustrations won her a Caldecott Medal for The House in the Night. 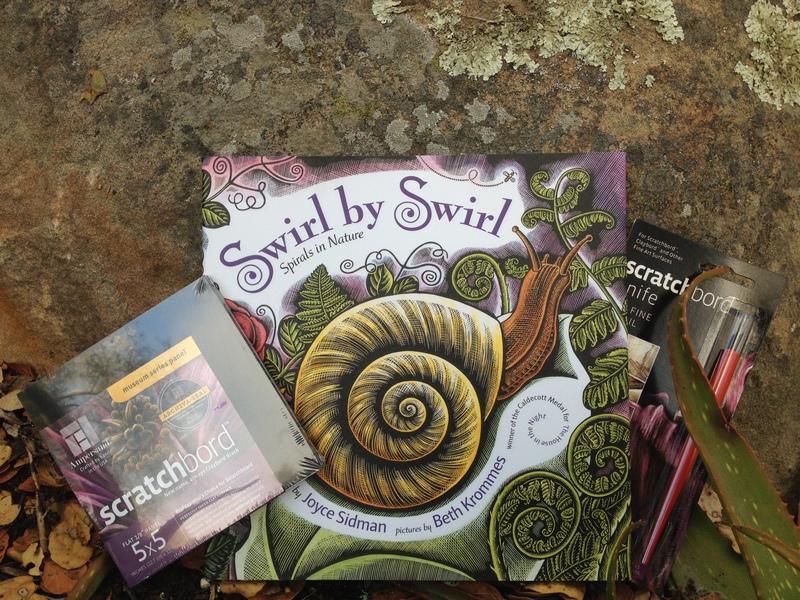 Beth’s most recent book with Joyce Sidman, Swirl by Swirl: Spirals in Nature, is a breathtaking view of the natural world, a poem that begins with one word and spins around itself into a spiral. It will send you searching for spirals everywhere you go. 1. Hi, Beth! When I told my daughter we could ask you ANYTHING, she quickly asked for “any tips, like for drawing really well, because I don’t.” I think she draws beautifully, but DO you have any tips for drawing really well? I was in 3rd grade when I discovered that I liked to draw. My parents bought me a drawing book of pencil sketches of horses, and a drawing pad and pencils. I spent hours laying on top of the pool table in the basement copying the drawings from the book onto my sketch pad. Copying other people’s pictures is a good way to train your eye to really look hard at something and to try to duplicate the technique that the artist used. 2. My daughter particularly noticed and liked that you use lots of overlapping. How did you learn to do that? I don’t just draw out of my head when I have to draw a realistic picture of a certain kind of plant or animal, like in “Swirl by Swirl.” I collect reference pictures from library books and images from the internet. When I need to design a picture like the endpapers on “Swirl by Swirl”, I spread all of my reference pictures out in front of me on my drawing table and just start loosely sketching on a large sheet of paper, overlapping the plants and animals. I use my eraser A LOT to change my mind about where something should go. I also start over about three or four times. I have a very full waste-paper bastket at the end of the day. I work out all of the pictures for a book in detail in pencil before I begin the scratchboard. If you go to the homepage on my website, wwwbethkrommes.com, and read the interview “Seven Impossible Things Before Breakfast”, you will learn much more about the stages of designing a picture book. 3. Do you ever make mistakes, and if you do, do you start over, or work around them? It is hard to correct mistakes on the scratchboard. If I haven’t scratched too deeply, sometimes I can re-ink over the mistakes and try scratching the picture again. But I often have to start the whole picture over. There is a big picture of a walrus and a hunter in my book “The Lamp, the Ice, and the Boat Called Fish” that I did over seven times. If I have a difficult face to draw on scratchboard, I’ll always do several trials on a small scrap piece of scratchboard first. 4. Sometimes you use lots of color, sometimes just black and white. Why? An illustrator will do what the text demands. “The House in the Night” was a story about night, so black and white was the way to go. It was the brilliant idea of my editor, Ann Rider, to add the golden highlights to give more zip to the pictures. “Swirl by Swirl” had to have full color because of all of the plants and animals. I prefer to work in black and white because of my background as a printmaker, but am becoming more comfortable with color the more I work with it. 5. Do you have a favorite swirl from the book, and do you have a favorite swirl that is not in the book? My favorite pictures in “Swirl by Swirl” are the ocean wave and the tornado. I can’t think of a favorite swirl that is not in the book. 6. Even though the book came out two years ago, do you still see swirls everywhere you look? I have always been fascinated with the spiral shape and I do see swirls everywhere! I am very proud of “Swirl by Swirl”, because I iniated the project before Joyce Sidman came on board as the author. The idea for the book came from a bunch of puzzles I was designing. I noticed all of the designs included spirals. I thought perhaps I could take some of those puzzle designs and turn them into a pre-school shape book about spirals. Ann Rider, my editor, wanted to see a book about spirals in nature–why things in nature are shaped like spirals. I tried to do the writing myself, but it was terrible. Joyce Sidman, also a spiral lover, heard I was working on this project and asked if we could collaborate. I said YES!!!!!! I sent her all of my sketches and notes, and she came up with the text. I had to revamp my sketches considerably, but was thrilled with the structure that her beautiful poetic text gave to the book. 7. I heard your next book, BLUE ON BLUE, is coming in fall of 2014. What kinds of beautiful blues will we get to see when it comes? It is essentially a book about a rainstorm. It is a lovely simple text, and it was fun to come up with the story told through the pictures. You will see lots of blue in the sky and water. Thank you, Beth, for coming on the blog today! I can’t wait for BLUE ON BLUE and whatever beautiful book is coming after! I’ll start… today my favorite spiral is the swirl of siblings in a smushy good morning hug! My favorite swirl can be found in my children’s eyelashes, especially having napped on them so that they have an extra curl. Their lashes are ridiculously long like their daddy’s! I love the swirls in baby hair! I’m loving all the beautiful swirls — keep them coming! I’ve always been intrigued by the swirls in shells. This book is so gorgeous that I brought it into my local library and the children’s librarian immediately ordered it (I couldn’t part with my copy)! I love the swirl of the Australian tree fern! Any swirl in nature is beautiful. After nature I’d have to say a cinnamon roll. 🙂 I can’t wait to see Beth’s beautiful illustrations, and paired with Joyce Sidman’s words? How does it get any better than that?! I love the swirls in the clouds and in Van Gogh’s Starry Night. The books are beautiful..definitely for the keeper collection! I know 🙂 I think so far I’ve bought four copies of this one. Hi I’m the librarian at Northwood Arts & Science Elementary School. We have a section for books that inspire us to draw–we are hoping we win this one! I asked the kids and we have agreed our favorite spiral is the spiral around the bookcases in our library!! The next best spiral is the spiral found in sea-shells. Thank you so much for the lovely interview; I’ve printed it to use with the kids in the library and art club that meets here in the library on Tuesdays. Oooh! Thank you — I kind of want to see a picture of your bookshelves now! When I interviewed Beth she liked that line of questioning too, about learning through using reference, erasers, and hard work! She was an incredibly gracious interviewee. I bet if your students have other questions, she would answer those too! Miguelito Elementary is our winner! Congratulations — the book & scratchboard set will be on their way soon! Everybody else, thank you so much for entering. I’ve bought at LEAST four copies of this one to keep and give away. It’s such a beauty — I wish I could give one to everybody!